The wow.com domain name has laid dormant since at least 1998, when it was acquired by AOL along with other assets of Compuserve. The domain has been coveted by a number of AOL business units over the years, though. At one point there was a discussion of it being used to house the netscape social news assets (they eventually settled on propeller.com). 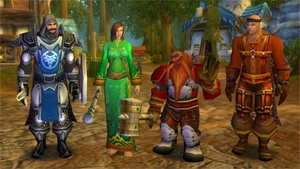 If our source is correct, a decision has been made as to the long term use of wow.com. It has been transferred to the AOL Games group and is currently being turned into a – you guessed it – World of Warcraft social network. We don’t have any details yet on the functionality of the site or when it might launch, but we’re digging. In the meantime, there are plenty of social networks surrounding World of Warcraft and other MMOGs – see Rupture, Warcraft Social Network, mmoguildsites, and Guildcafe. For related news, see our coverage of Sparter, which runs a MMOG currency exchange. As a semi-random aside, click on the image above to see a clip from the Southpark World of Warcraft episode.